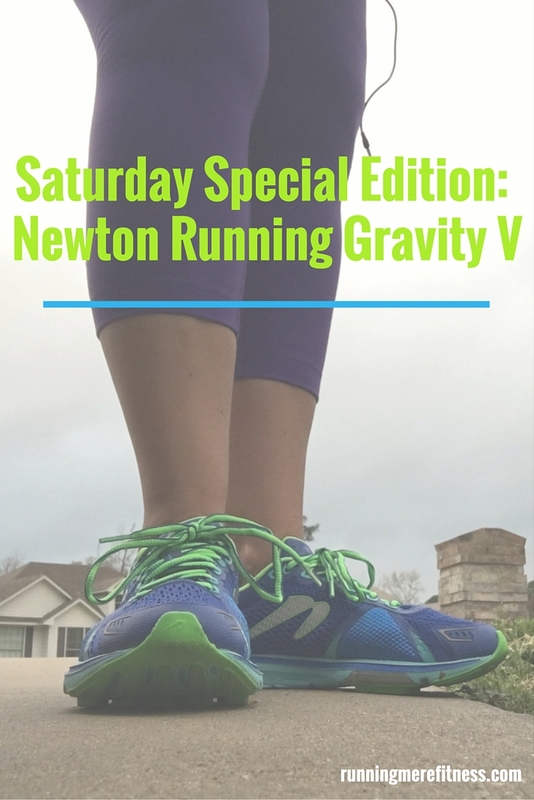 Saturday Special Edition: Newton Gravity V! 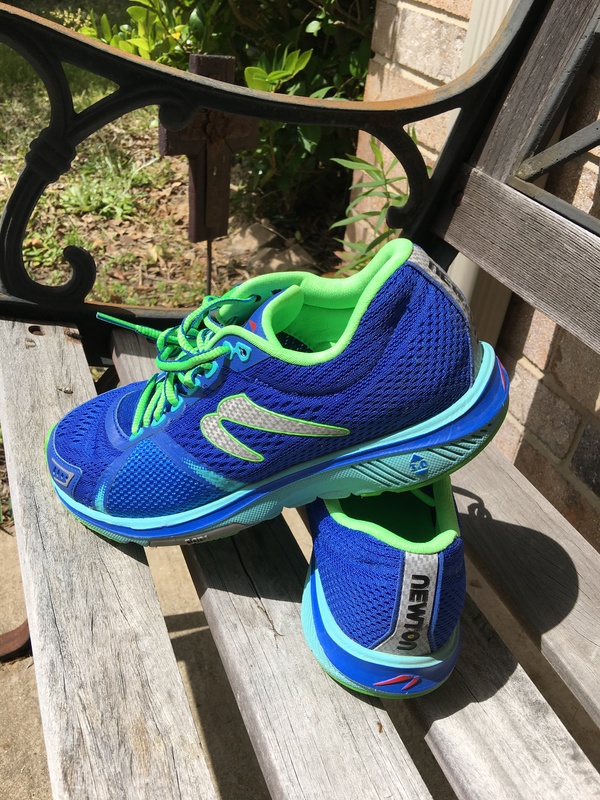 Guys, I was super stoked to receive a pair of the newest version of the Gravity shoe for review back in March from the folks at Newton Running! The Gravity V and its predecessors are mileage trainers made for runners with a neutral gait and can be used in both training and racing situations. 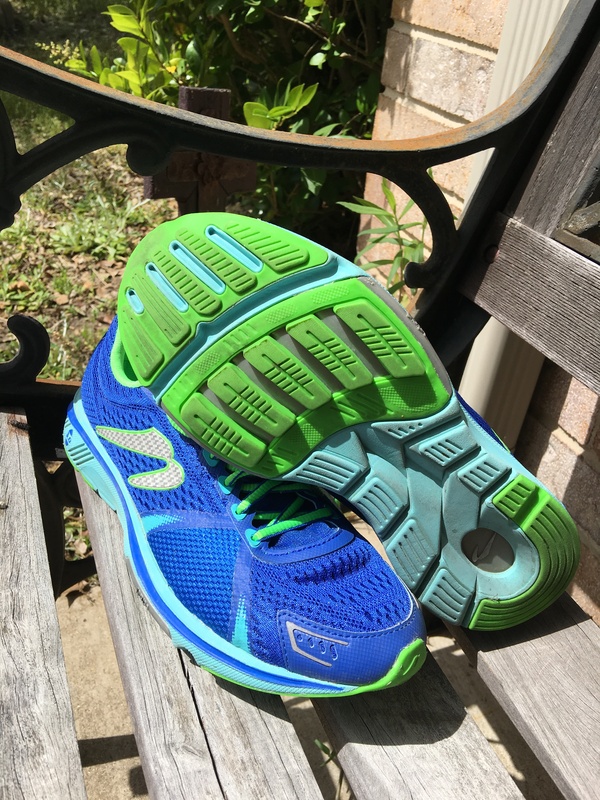 I discovered these shoes through some running friends back before I ran one of my first half marathons, and I’ve been a fan ever since, and will be for life! All of my major races have been ran in these shoes, and I wouldn’t consider racing in anything else. The guys at Newton have created a brand of shoes that promotes an overall more natural running stride, with placement of the ever infamous lugs (made with their patented action-reaction technology) under the mid foot to promote striking in this area as opposed to in the heel. This portion of the shoe is what really sets them apart, and is home to one of several different P.O.P, or Point of Power platforms customized to the intended ride of the shoe. 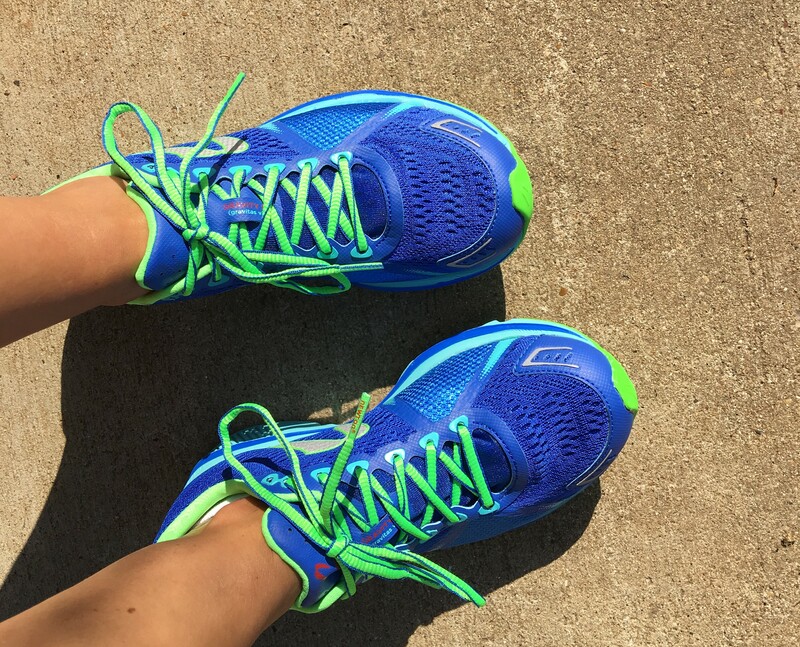 These shoes are made for runners of all types and come in a variety of styles and models to fit your needs. Disclaimer: The awesome folks at Newton Running sent me a pair of these shoes at no charge to me for review. However all opinions contained in the this review are completely mine and based on my personal use of this product alone. This past weekend I participated in Tyler’s FRESH 15K race, which has become a fast favorite of mine. It is hands down, the best local race I have ever been a part of, even in its inaugural year back in 2014. I wasn’t able to run it last year but decided back in the fall that I was going to get back into running some races and this would be my first one. The holidays came and went. The start of my 12 week training plan approached and I was so excited. And then the theme of this whole race preparation began, if you can even call it a theme. As most of you know, I coach and participate in CrossFit regularly. And you might also know that the CrossFit Open begins the end of February. Also not too tough to guess how much I love CrossFit and what a big part it has had in my fitness journey the last two years. So I began my dance of trying to stay on top of everything. Not that I’m at the point of being remotely a master’s qualifier, I just want to put the very best effort into what I do, especially when the Open comes around. The plan I thought I had in place just didn’t go well. It just didn’t. I’d miss a training run, then get back at it. Got sick. Flareups with my back from an old issue. And the weeks into the training plan kept ticking by. I should also add that we are preparing to sell our house, so free time has been filled with cleaning up, organizing, putting things away….you name it. Weeks tick by until I’m a week out of the race. Realization sets in that I’ve managed to log a single “long run” topping out at 4 miles as compared to my training plan that finishes with 8. The highlight of the week is when my Newton Gravity V’s arrive (sent to me for review which will be posted in the coming weeks, yay!) so I take those out for a spin or two. They feel fantastic as expected, but I’m beginning to adjust my race expectation. 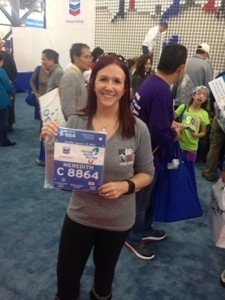 Pick up my race packet two days before….and I’m abnormally nervous. Then race day is upon us. The morning after one of my nearest and dearest friend’s wedding. I arrive early, without family in tow, park and make my way to the corrals. It did take me more time to park and get things together at my car, so I get to the starting area with not as much time as I anticipated to spare as I’d have liked. And every runner knows where I’m going with this…..the potty line is LONG. So forget it. In a few minutes we are off. I hold back on purpose remembering when’re my long run topped out, in reflection, probably a little too much.Before really settling in before then end of the first mile it’s pretty clear I need a potty stop or I’m going to be hopping on one leg. At mile 2, I stop. And there’s a line. Of course. what else I gong to do. so I wait, mission accomplished, and back on track. Pretty uneventful up until mile 6 or so. Thinking I feel better than expected! This is good! Shoes are feeling fantastic! See some familiar faces along the way. Remembering why I love the race experience so much.Then we head down Grande and hang the left into Hollytree. It was then I felt that my finish would not be near what I hoped or wished for. It was just going to be what it was. For those last just over three miles. I prayed. I rallied and I faded. And rallied again. I ran some hills, walked some hills. As we crossed back over into Fresh, I knew without even looking at my watch that I was not going to improve nor match that first year’s time. When you’re competitive with yourself, consistently demand improvement from yourself, and are a perfectionist, that hurts. But somewhere in that final 1/4 mile, I made a decision. I will celebrate the finish. Because, you see, there was a time it hurt to run. When 200 pounds didn’t want me to run. When I was trapped in what someone else I loved’s idea of what I should be. Yeah, it wasn’t a finish I was proud of. But it was a finish. A finish that those who can’t run would have loved to been able to claim as theirs. I had nearly forgotten, in the frustration of a training plan gone wrong, why it is I love to run. Because when I took those steps at 200 pounds, running is what saved my life. Putting one foot in front of the other, kept me off meds. Kept me from losing my mind. Gave me myself back. So with a smile I crossed that line. For the rest of the day I celebrated that medal, that finish. Appreciating the fact that my fitness is at a level in which running 9 miles without ideal preparation is possible, to that I owe CrossFit. And when I resume training runs in the next few days, I will be working a different plan, still thankful for the lessons learned in those 9 miles, committed at a different level because I owe it to myself. Heartbreak Hill, I’ll be back. Happy Saturday, guys! This week I’m featuring a review of some compression tights I received from SKINS over the holidays. You may have seen the long version of these tights featuring the Doughnuts and Deadlifts logo around the CrossFit or Olympic lifting world. Been eyeing these for a while and wanted to give them a whirl during some running and CrossFit workouts. They certainly did not disappoint! I chose to try out the women’s A200 3/4 length tights. With our crazy weather here in Texas, I figured that length would be appropriate for most of the year. When placing my order it was easy to determine the size needed, as they provide a sizing chart based on your height and weight on the website. The A200’s out of the box looked even better in person! The come in several different color selections, but I chose to go with the basic black pair. I was impressed with the stitching on all the seams as well as the quality of the reflective accents and logos. If you’ve seen my closet, you know I’m all about some flashy colors, patterns, cool branding, or something like that, so I was pretty pleased with the overall look of these. Truly a compression fit, I found that the sizing was definitely spot on, but not so compressing to the point of discomfort. Score! My usual complaint on compression fit is how overly tight they feel while still refusing to stay put after I start moving around. Length was also perfect, I’m roughly 5’3, and these stop at about mid-calf. A couple other features include a small hidden key pocket and drawstring inside the waistband. During my first outdoor run in these I was happy to discover they did not roll down, move or slide. Stayed breathable, almost like cooler air entering them as I ran, while keeping my muscles warm at the same time. I cannot say enough about the support! Right amount of compression during the entire run. Definite score! In addition, I went through several CrossFit workouts in them. Lots of squatting, bending, jumping, and they still stayed put without any waistband roll! No tugging or adjusting during the workout, it was fantastic! I felt like they were able to stretch and move with me in all the right places. I’m a pretty sweaty creature when I workout, so I definitely encounter issues with tights working themselves down. Normally I catch myself tugging and pulling them up between sets of burpees and such. Not with these! Because of the fact I’m a sweaty mess after any workout, I knew that these would have to withstand lots of laundry time. After washing, logos and seaming stayed intact, no hint of sweat odor at all! They came out of the wash looking brand new and ready for the next workout. Disclaimer: The awesome folks at Skins sent me a set of these tights at no charge to me for review. However all opinions contained in the this review are completely mine and based on my personal use of this product alone. Every year has its ups and downs. This one hasn’t been any different in that regard. Financial burdens, career confusion, decision to downsize and sell our home….. sure it’s not been easy. But I must say, I feel hopeful, optimistic, and excited about what’s to come in the new year. I praise Him for the good and the bad…blessings come from the darkest places sometimes. As the optimist in me is writing today, here’s the celebratory highlight reel and what’s in store for 2016. This past year I got somewhat away from running races, but closed out the year with a local Turkey Trot and friends. Running is where my change in fitness very first began, so this year I’m looking to run a few races, first one being the Fresh 15K in March. CrossFit has been a huge presence in my life this year. The GymFed family I train with is just none other than amazing. My job doesn’t really feel like a job, and watching our athletes continue to grow is just the best feeling evah! My personal fitness has continued to grow. After a last place finish in my first ever CrossFit competition, I decided there was a level of fitness I needed to strive towards before entering another one. And that I did, improving to an overall sixth place finish at Festivus. The question is, will there be more competitive appearances? Most likely, yes. The CrossFit Open begins end of February, that will be the initial focus, and then go from there. I’d like to do some others, even a team format event, but much is still in the planning. Nutrition was and has been a huge stumbling block for me in the past. Through two Whole30 resets and adopting a mostly Paleo lifestyle I’ve managed to gain consistency. Still continuing to adjust things out to improve my workout and encourage muscle gain. Rediscovered coffee. Mostly eliminating grains, sugar, and dairy has done so much for me. Sleeping better. Workouts better. Feel so much better overall. Along the same lines I’ve been moving towards the use of more natural products and essential oils. Did I mention I rediscovered coffee? Kicking off Whole30 number three on Monday. Towards the end of the year, I began picking back up on the blog again. I’ve received the opportunity to write some reviews on some great products which will be featured here pretty soon. With growing my blog I’ve been working on a larger social media presence, and recently found out I’ve been named a Sweat Pink Ambassador where I’ll be able to network with a community of fitness folk! And I’m super pumped to have been added as a contributing blogger for East Texas Moms Blog that will be launching very shortly! There will be some amazing content and resources for moms out there crafted by some pretty incredible ladies.So very excited to see where both these projects go! And last of all…..I can’t list all these great things out and totally leave off what a blessing my family has been. How we have been more intentional at the end of this year about our faith together, praying together, studying the Word more together. Having Dani bring up questions and comments about Jesus, asking to be baptized, and was baptized in October. This is the part that matters. I can’t wait to see how it changes and shapes each of us. Mobility. It should be part of your workout routine every day, just like packing your gym bag or mixing up pre workout. Most of the time stretching or mobility work is looked at like extra stuff or for the older crowd. Well I’ve got news for you….it’s for everyone. Let me illustrate this by asking a few questions. Do you have issues holding the barbell overhead in the correct position while squatting? Are the bottoms of your upper arms parallel to the floor in the front rack position? Does your stride shorten when running? Do 400m runs cause your outer thighs or ankles to ache? Do your heels come off the floor when squatting? Most athletes I work with would answer yes to at least one of these or I would be able to note them during a movement to some degree or another. Here’s what we do. Every day we work to grow muscle, drop body fat. Get stronger, right? Now this is not a super scientific explanation, so bear with me here. This process of creating small tears in our muscles and allowing them to repair themselves causes the muscles to get bigger, and without any stretching or mobility work, shorten. Shorter muscles decrease the length of your levers, thereby affecting our range of motion. Now this problem is not restricted to muscle alone, but tendons and ligaments suffer similarly as they are pulled on by the ever shortening muscles. Months and months of this go on, as we hop into our cars after a tough WOD or lifting session without taking a minute to stretch or use a foam roller. Muscles tighten, we lose flexibility. If you’ve watched any professionals in weightlifting, CrossFit, or running, you recognize that they are efficient movers. Weightlifters go to a bottom squat position where they might as well sit on the ground, athletes execute pullups and toes to bar in easy rhythm, and runners elongate their stride and strike each foot softly on the ground. None of these things are possible by strength alone.These folks work their mobility, daily. So where and how does one start to build mobility into a daily habit? Here’s a few tips to get you started! Identify the areas where you feel you lack mobility. Think about where you struggle during certain movements and that can clue you in onto where to start. Better yet, have a coach observe you in a few different movements and give you some feedback. Set a goal to spend 5 minutes working on one area after each workout. Don’t get overwhelmed here, Rome wasn’t built in a day. Pick the area you feel needs the most work and start with that. In the beginning it may feel like you’re not accomplishing much in that period of time, but as you get more proficient at the techniques you’ll be able to work through a routine faster. In addition, I suggest you do these after a workout or at least after a warmup like running or rowing. Warm muscles respond much better. Dig into some resources. There’s lots of information out there, but my favorite source of all things mobility comes from Kelly Starrett of mobilityWOD.com. If you prefer the printed word, he has a couple of books written on the subject, one of which is more focused on running. He’s a CrossFitter himself, so he understands the issues a lot of us have. In addition, don’t forget your trainer or coach should be somewhat familiar with these exercises and can definitely help you figure out some things to try. If you need pointing in the right direction I can help you out with some exercises to start out with. Invest in a couple tools. Some of these techniques can certainly be done at home provided you have the right items at hand. Over time, accumulate a lacrosse ball, foam roller, and maybe a voodoo band and some resistance bands. Without a large investment you will have what you need to work through these exercises. Some stretches don’t require any equipment. Start with one area, be consistent, and test your progress. Keep it simple here. Work with one muscle group, get a few sessions under your belt, and test how it’s working. If you’re struggling with tight hip flexors that limit the depth or comfort of your squats, try out some air squats to see how things feel after each session. December 1st. Confessional. I want to do it all. Every year, every month….who am I kidding. Every day this happens. My desire to DO IT ALL. Every fun run, every holiday party, every plan for a goal. All of it. I want to do all of it. But I know I can’t, nor should I. Indeed, I know the outcome. It’s not pretty. You see, all my life, I’v e struggled with the same principle of diving in, taking too much on, doing it all. Because I want to do it all. And not in just one area, it is everywhere. Especially with my own fitness, as my capacity grows, I want to keep pushing my limits. How much more? How much faster? How much farther? An then you add extra work for specific goals and it turns into trying to do every plan for every goal at once. And that just doesn’t work well. Overtraining happens. Fatigue. And possibly injury. Burnout. Today I wrote myself out a list of goals for the next couple of months. CrossFit gymnastics skills, weightlifting, and distance running are all sitting there in black and white. Urge to do it all is there, especially seeing those words on paper. But then I stop and remember…..I am a mother, a wife, a daughter of the King….and I use my fitness to live my life, make it better! My life is not defined by this list, but made better by the list! It is December, leading up to Christmas. There are so many distractions, and that’s ok. It’s about finding the right amount of work, finding that balance. Creating a schedule, making and keeping appointments with yourself. Determining that point at which you are putting in consistent, meaningful work but not consumed by it. So here comes the question. Where is that point? There’s no blanket answer. It’s different for everyone. it comes from trial and error, paying attention to what you can mentally and physically handle. A few posts back I was discussing setting goals and why right now is the perfect time to start working toward those goals. That hasn’t changed, but this is where the element of creating reasonable goals is important. Prioritizing those goals even more so. Pick out what you want to accomplish that will fit into the time you have. Know that yes, you may not keep to a plan perfectly, but also remember this is not the time to throw all caution to the wind. Don’t use that same mentality to turn an off plan meal or missing a workout day into a multi meal feast or a long workout hiatus. Keeping effort consistent and knowing you can maintain a plan will set you up for the coming mother-of-all-goal-setting days, January 1st. You can look back proud that you started going after what you want now instead of putting it off. So many setbacks. So many hurdles. So much doubt. 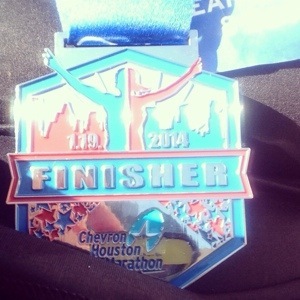 When I initially entered the lottery for the 2014 Chevron Houston Marathon, I figured what were the odds? Don’t get me wrong, I wanted to do it….but I was scared to death to even try. When I got my acceptance email, I freaked! Now I have to train! Long runs?!? After two half marathons I knew what that distance felt like…but this? Repeatedly approaching 20 miles? Oh dear. But I started, I committed. Financially things were a mess with my husbands job and through trying to budget in new shoes, I purchased some on sale Nikes (I’ve been a dedicated Newton runner for well over a year). Then injury hit. Foot pain that wouldn’t allow me to continue. Got over that. Then illness took the kiddo and myself down. Return of the foot pain and I guess my knee didn’t want the foot to suffer alone. Sprinkle in husband away working and lack of childcare. All in all I lost weeks of training…and only peaked at 14 miles in long runs. Stupid shoes. Hubby left to train for new job. I went back and forth between switching to the half or deferring….couldn’t do it. Common sense lost out and pride won. I was gonna go down fighting. After the preparation I had been able to put in, I couldn’t just not try at all. The taper felt like a blur but I ran as scheduled. Went back to my old Newtons with new insoles as a last ditch effort to make injury stay away. Tape, ice, rest, repeat. Short runs were always accompanied by soreness but relenting enough to keep me crossing them off my calendar. Several of my running friends listened to all my doubts oh so patiently and gave me fantastic advice. I pressed on. Race weekend arrived! Husband called an audible and was going to be able to make it home for the road trip to Houston with a couple of my running friends! Loaded up and off we went. Got myself KT taped at the expo and stared at my race bib. Dear Lord, what was I thinking! Pasta lunch at expo attacked each of our foursome at some point in the weekend, tethering the husband to our hotel room when I left for the start corrals with my buddies. Energy was huge, start line was electric. I’m thinking….I’ll be the last one in out of all these runners. They’ll be closing up the start line behind me. Unplugging the time clock. Please just let me finish! Next thing I know, I’m over the line and hit start on the watch. I consciously dial myself back. Don’t go out fast. Pasta begins to talk at mile two, and at mile three I stop at the portalets. Yep, first time to do THAT during a race. But I feel tons better and click away solidly until 13 miles, only distracted by a burning sensation under my right arm which I inspect. Chafing to the point of bleeding. How nice. Undeterred, I continue running….walking through a few water stops and by one of the medical tents for Vaseline on a stick (which I apply to the inside of both arms while running…yes another first!) Feeling good. Mentally I got scared at the halfway point. Everything after 14 was unknown…never felt this mileage before. Pressed on. Told my brain to shut up. Used my GU. Hydrated. Approached 20. In one moment I felt sure I’d finish then felt as if I’d slammed into…yep, THE WALL. Injured leg never hurt, but I was aware of increasing pain in my left foot. Mile marker 21. Wall dissolves. I pray prayers of thanksgiving, turn up my playlist and press on. Mile 23 hurts but it’s just a 5k left. Almost done. I walk a few inclines and stride the downhills. Course swings back into the sea of downtown and I begin to sing to my music out loud. I realize I’ll finish. No stopping now. Foot pounds. One last walk break. Holy moly, mile 25. I’m finishing….it’s a blur. At 1/2 mile to go the spectators are lining the course, cheering, looking for their runners. I see my husband walking towards the finish line. He turns and sees me. I break into a smile, feeling my salt mask crack a bit. I obtain visual contact of the finish. My eyes water. I think of my mom. I think of my 200 pound self. I hear my two running buddies call my name. I pump my fist and sprint for the finish. I’m across. Then there’s the medal…it encourages the tears from my eyes. This moment can never be taken from me. All my life I’ve doubted my mental toughness, argued with God about do I have what it takes to live this life. And for the last of my firsts in H-town….I can finally say yes. So far I don’t think 2014 will differ one bit. I’ve set huge goals personally and professionally. I’m striving to grow in every way possible. And it’s going to involve change, new territory, new things to learn. I’m taking on new clients at the gym after having great success with my top 5 placing 100 Lives in 100 Days team challenge. Striving to inspire more and more people that they don’t have to settle for life as is, that they can do more, be more, kick meds to the curb, chase their kids! My goal is to do this as much as possible, it’s my heart. It’s what I’ve been called to do. I have the goal of keeping small group training sessions full of people ready to change their lives. But that’s not all….this Sunday, I will achieve one of these goals….the marathon. 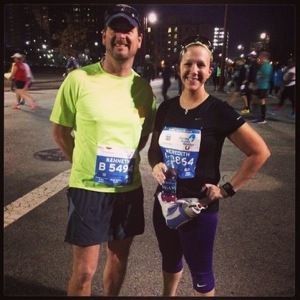 I’m running the 2014 Houston Marathon. EEK! The training has involved so many hurdles…suffice to say if it can go wrong, it has during the last three months. I’m hoping just to drag my carcass across that finish line. For me, this puts the stamp on my lifestyle change, validates that I’ve really done it, I’m really a runner. Will this be the first of more? I don’t know….ask me Sunday afternoon! I’m also sad to be running without being accompanied by my husband, who is not a runner, but the greatest support system I’ve ever had. Instead I’m carpooling with another new runner friend and his better half (sorry, Kenneth…haha). I can’t write any of this without being reminded that as big as any goal or achievement is or can be, don’t lose sight of or forget the value in the journey. Appreciate your ability to even work towards a goal even if you don’t succeed or you think you stink! There are those out there that maybe can’t dream of doing what you do or maybe physically just can’t perform the task. How they would relish being slow or allowed a chance at something! At the end of last year, I signed up with a organization called IR4. It matches runners with children and young adults that have some limitation on activity, and runners dedicate their miles to the person they are matched with as a form of support. I have yet to be matched, but already it has given me another sense of urgency and changed my attitude when I don’t want to run. Secondly, I have a friend and fellow trainer whose boyfriend of 8 years is currently in ICU with serious complications from the flu. Oh how they both would give for him to jog around the block right now! I pray every time they cross my mind for his healing and recovery. Don’t forget the people put into your life along the way either. I have been blessed with coworkers, clients, and new friends that remind me what it is to love each other more just as Jesus calls us to. My list of goals is lengthy and industrious….so I refrain from listing them all right now….but I’m getting ready for change. Can’t wait to see what the year holds. So thankful.